Welcome to the Cuyahoga Valley National Park Information Page. Cuyahoga Valley National Park was originally established in 1974 as a U.S. National Recreation Area. In 2000 it was re-designated a U.S. National Park by Congress. It sees more than three million visitors a year, making it the fifth most visited national park according to the U.S. National Park. The park also offers an excellent look into the Industrial Revolution. It offers visitors the chance to learn about the Ohio & Erie Canal, which was a crucial part of trading and commerce in the late nineteenth and early twentieth centuries. Cuyahoga Valley National Park also has a number of sustainable farms that provide a good look into the agricultural history of the valley. Floodplain and upland forests. The park encompasses 51 mi (134 km and 33,000 acres) along the banks of the Cuyahoga River, spanning from the major metropolitan areas of Cleveland and Akron into the hills of the Allegheney Mountain range. The diverse landscape, including sandstone ledges, 70 waterfalls (most notably Brandywine Falls), rolling hills and river gorges, can be viewed from 186 miles of trails. Coyote, beavers, flying squirrels, white-tailed deer, gray foxes, red foxes, rodents, reptiles, birds, and fish. Maple, oak, birch, beech and hemlock trees. Look for many different types of wildflowers, including Ohio spiderwort, wild hyacinth, trillium, showy orchid, pink lady’s-slipper, purple wood-sorrel, violets, wild blue phlox and Indian paintbrush. These are only a few of more than 250 species that grow in Ohio. Hiking comes in great supply at this national park. They have over 125 miles of trails for you to explore and enjoy. Trails pass through many different scenic environments, including fields, wetlands, and woods. Trail difficulty ranges from easy to challenging. The most popular trail at the park is the Ohio & Erie Canal Towpath Trail. This easy trail covers a distance of 19.5 miles, has a total of ten trail heads, and connects with many of the park’s natural and historical attractions. This trail is almost entirely level which makes it the perfect trail for all visitors. Also available to hike is a section of Ohio’s Buckeye Trail. The Buckeye Trail is a 1,400-mile trail that travels all over Ohio, and you can enjoy a part of it at Cuyahoga Valley National Park. 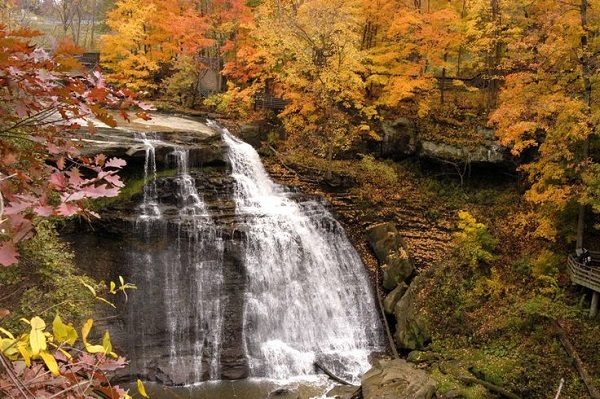 In addition to hiking, Cuyahoga Valley National Park offers many other outdoor activities. Feel free to take a bike ride on one of their designated bicycle trails. The Brecksville and Bedford Reservation All Purpose Trails, the Ohio & Erie Canal Towpath Trail, and the Metro Parks’ Hike & Bike Trail all are available for your bicycling pleasure. Canoeing is permitted only in the Cuyahoga River, but due to the water conditions canoeing is also strongly discouraged. Visitors that still wish to canoe should note that there are currently no canoe liveries available. Swimming is permitted in all areas of the park with the exception of Indigo Lake and Kendall Lake. Once again, this is not encouraged by the park because of the highly erratic water conditions. Located within park boundaries is Dover Lake Waterpark, which offers the perfect alternative to swimming in the river or ponds. Enjoy your favorite winter sports at Kendall Lake Winter Sports Center. Activities offered range from sledding, to cross-country skiing, to ice skating. A ski patrol regularly patrols the area to ensure your safety. Rental for cross-country skis is also available. Costs are $15 per day, and $7.50 per half day. Skiing is only allowed when the snow is at least six inches deep. The Center requires either a valid driver’s license or credit card as a deposit. Call (216) 524-1497 to register in advance for skiing lessons. Canal Visitor Center focuses on life along the canal and human history in the valley. Canal Visitor Center is located 1 miles south of Rockside Road on Canal Road at Hillside Road. Happy Days Visitor Center is primarily an information/orientation facility, but also holds a variety of interpretive and musical programs. Happy Days is located on State Route 303, 2 miles east of the Village of Peninsula and 1 mile west of State Route 8. Hunt Farm Visitor Information Center has exhibits highlighting agricultural history and recreational opportunities in the valley. Located on Bolanz Road between Riverview and Akron-Peninsula Roads. Boston Store exhibits tell the story of canal-boat building in the valley. Boston Store is located 1/10 of a mile east of Riverview Road on Boston Mills Road. Peninsula Depot Visitor Center is an information/orientation facility developed to help visitors explore Cuyahoga Valley National Park, Cuyahoga Valley Scenic Railroad, the Village of Peninsula, and the Ohio & Erie Canalway. The Peninsula Depot is located in the Village of Peninsula, on Mill Street north of Route 303.